In the week-plus that I’ve been in Buenos Aires, I’ve been largely laid up with a sore leg and some flu-like symptoms but, last Sunday, my nephew Manuel Massolo dropped by and drove me to the former Escuela de Mecánica de la Armada (ESMA), the notorious torture center of Argentina’s 1976-83 military dictatorship that cost his mother her life. 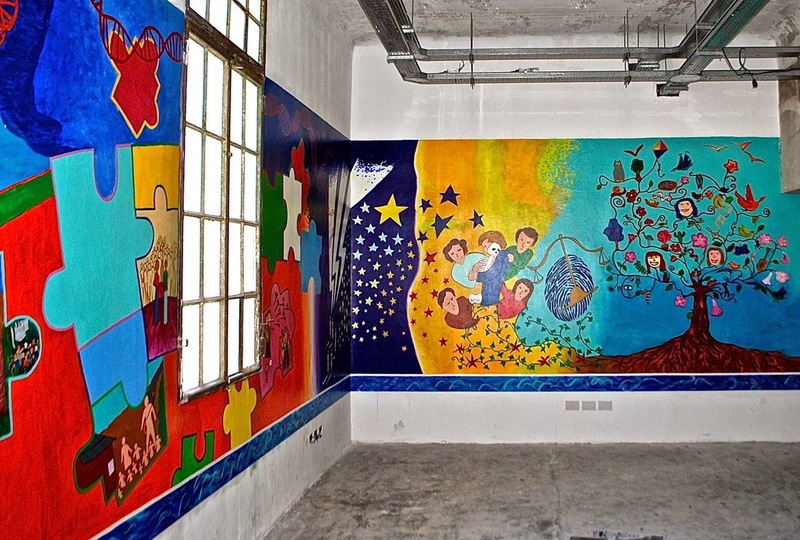 Manuel was barely a month old then, but he’s now a well-adjusted adult, with a fine sense of humor; on this visit, his goal was to help complete a memorial mural (pictured above) at the site. 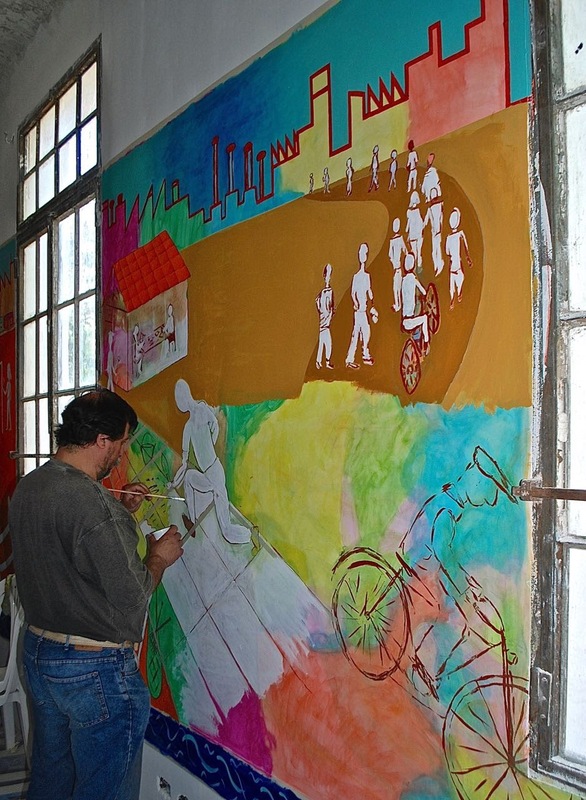 I had previously toured the current Espacio Memoria y Derechos Humanos (Memory and Human Rights Space) – not an experience for the faint-hearted – but the new mural (on which Manuel, above, was working) will be part of the reception area for the DNA information facility organized by the Equipo Argentino de Antropología Forense (Argentine Forensic Anthropology Team) to identify the remains of the dictatorship’s victims and their living descendants (some of whom were “adopted” by the families of the killers). I was invited to participate in painting the mural, which a mostly volunteer group finished late that afternoon, but declined because my artistic skill is inversely proportional to my respect for what they were doing; I can also offer the excuse that my leg prevented me from standing up for any length of time. I was pleased to see Claudia Bernardi (pictured above, center), a Buenos Aires native and frequent dinner guest at our house who teaches at the California College of Arts. She contributes to community art projects in many places that have suffered from state terrorism and human rights violations, including El Salvador; on this occasion, she was helping coordinate what was a collaborative project, and her suggestions to the crew kept things moving. I also spoke with Martín Sanllorenti, Manuel’s mother’s brother (pictured above), whom I had not seen for many years (he remembered me before I did him). When the group broke for lunch, I took a cab home, but Manuel informs me that they did indeed finish the project - which treats the topic as something of a jigsaw puzzle - that afternoon. 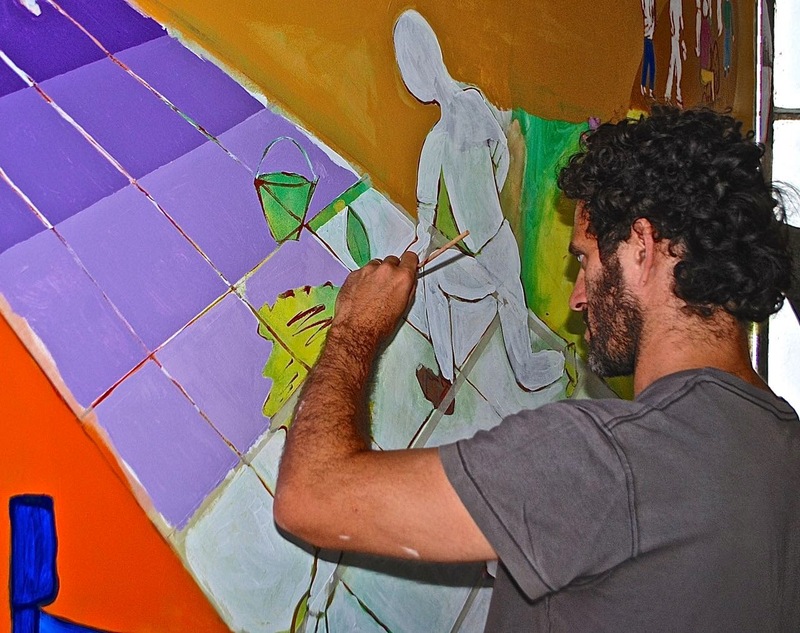 Now, for the time being, he can go back to his own work – while his day job is occupational therapy, he also paints works such as the canvas below, based on the floor plan of the Congreso apartment that he (and other family members, including myself and my wife) have occupied at various times in Buenos Aires. 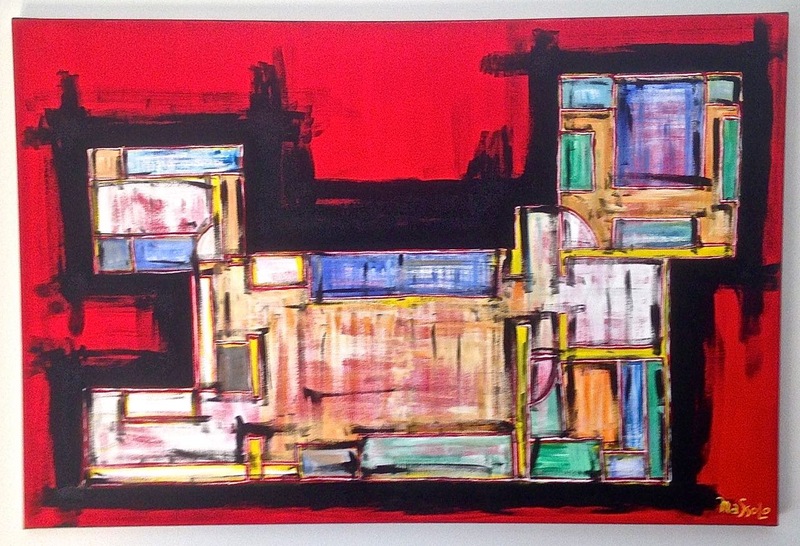 That painting hangs on the wall of our Palermo living room. He’s recently sold a couple similar works to a friend of ours in San Francisco. I’ve never asked him about but it seems, at least superficially, that Manuel takes some inspiration from Argentine artist Guillermo Kuitca.